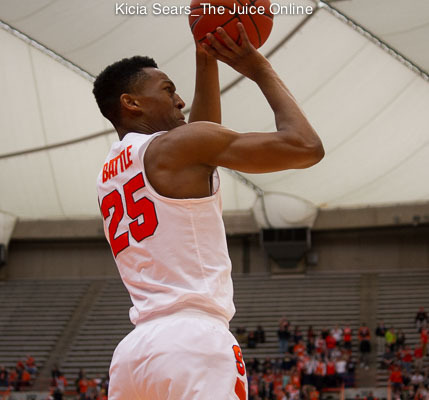 Thank you, Tyus Battle. Thank you for staying at Syracuse and giving me hope in the most dire of times. Without the news that you were staying for your sophomore year, I would have to dwell on all the negatives currently plaguing the Orange Basketball World. Instead of looking forward to your development as Syracuse’s alpha dog, I’d be dwelling on the second sub-20 win season in three years, after a streak of 17 straight 21+ win seasons. I’d be lamenting the most losses in Coach Jim Boeheim’s history, versus imagining you average 18.5 points per game for an entire season, just as you did for the last six games of your freshman campaign. Rather than picturing you and Taurean Thompson becoming a dynamic one-two punch, and shoring up defensively after a shaky rookie outing in the zone, I’d probably be pining for Coach Hopkins after he left to helm his own ship at the University of Washington. 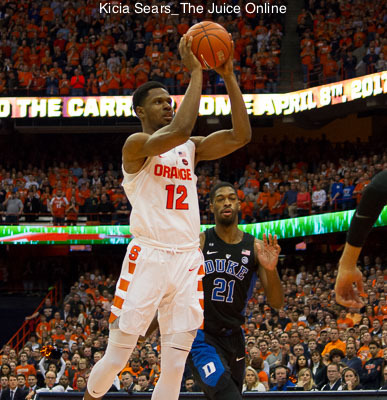 Without you Tyus, I’d be solely focused on the downward spiral Syracuse Basketball seems to be in, with losses piling up, annual NCAA Tournament invitations disappearing, and a lack of depth moving forward. Next year’s team will resemble this one, with you taking the place of Tyler Lydon as the returning budding superstar surrounded by a mix-and-match of who knows what. It didn’t go so well for Tyler, but I think you are different. I truly think you are special. Sure, it’s not all perfect. You need to start using your athleticism to rebound at a rate that is a lot more respectable than the 2.1 you averaged last year. Hopefully that will come with experience. But, hey, why focus on the negative? Instead, I want to focus on the fact that you got better as the season went one. You never shied away from the spotlight and stepped up in a huge way. You weren’t supposed to take that game-winner against Clemson, but you did and you drilled it. Unlike Tyler, who seemed to be legitimately scared to shoot the ball, you never hesitated when you got your chances. You scored a season-high 23 points against Virginia, who was ranked #1 in points allowed in all of college basketball this past season. 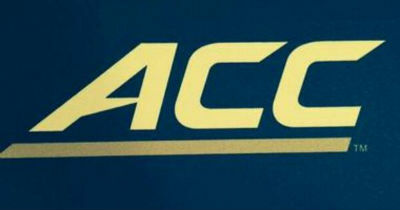 And, you did it as the 4th option on offense. Just imagine what will happen when they let you take more than 8.6 shots per game. With a lot of missing pieces, we’ll have to wait and see who is lining up beside you and Taurean on opening night. Whether it be recruits, transfers, or the new graduate student incarnation of the one-and-done, the Orange only has a fighting chance at the tournament because you’ll be there. With all of the turmoil and uncertainty surrounding the program, I could easily be my usual pessimistic self, and be justified in doing so. You are the only reason I am holding out, and opting for hope. So thank you for staying. Please don’t change your mind.